The Triangle L Ranch — our getaway for a few glorious days in Oracle, AZ. I got no pictures that did justice the small but quite exquisite main room, but the sleeping porch came out all right — the perfect place to escape the summer night’s heat. On the side table sat a couple of books on local history, and of course I read one of them. 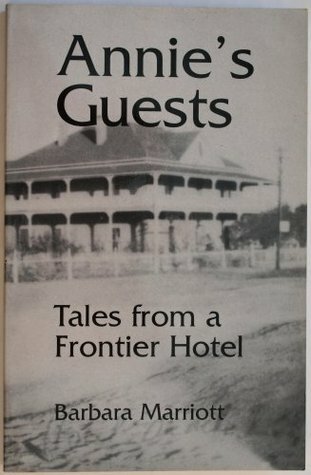 Annie’s Guests: Tales From a Frontier Hotel by Barbara Marriott. It mostly looked at Oracle’s Mountain View Hotel, built and run by Annie (Box) and William Curley Neals, who were both of mixed Cherokee, African American and English ancestry — a fascinating discovery, and one I shall write about more. But there was a chapter on William Bloodgood Trowbridge who once owned this ranch, so I shall start there. He came from East Coast money, and arrived in Oracle on what seems a most slender whim — when hunting with friends on the other side of the country they became fed up with their luck and headed out west without even going home for a change of clothes first. Money, like I said. He decided to stay on a while, and returned regularly (staying at the Mountain View of course). When it came up for sale, he bought the Triangle L in 1924. It had been built for Mrs Westry Ladd, another woman of East Coast money whose family had built the Baldwin locomotive engine. This began its life as a place of privilege with its wooden floors covered with Navajo rugs and comfortable antique furniture.– but it feels a surprisingly modest, comfortable and welcoming one. Most of the chapter, however, is about Trowbridge’s rather tawdry love affair — I am a bit more judgmental than the author I am afraid. It seemed Trowbridge had some kind of understanding with the daughter who with her mother managed the ranch — when he broke that informal engagement to marry a Miss Smith from Edinburgh, he moved them to another ranch in the area. The marriage did not appear to be a happy one, and he commenced an affair with a woman named Margaret in Tucson. While he burned the letters he received from her, she failed to burn his. They are a rather depressing look into a relationship where you really hope she was just in it for the money — Trowbridge, despite all protestations of love clearly had no intention of leaving his wife. His parsimony is often hinted at, and in fact he asks Margaret to keep an accounting of her expenses and the money he gives her so he can review it. It all goes wrong, he is blackmailed by the family, the wife finds out (though she seems to have known much all along). Not very interesting but for the fact that somehow, some way, the packet of his letters to Margaret were found in the disused well on the ranch itself — I imagine it must be this well, right next to our temporary home. A wonderful place to stay and explore the surrounding country — Oracle, Buffalo Bill Cody’s mining claims, beautiful hikes through country teeming with wildlife and the most wonderful views, the Biosphere 2. All coming up.